Scientific notation is used to express very large numbers and very small numbers in standard form/ scientific-notation using exponents. Scientific-notation is just a short hand way of expressing gigantic numbers like 615,000,000 or incredibly small numbers like 0.0000000000118. This method is used by engineers, mathematicians, scientists. • 1.2 ×10 14 -> the positive exponent indicates a large number. • 7.89 × 10 -21 - > the negative exponent indicates a small number. 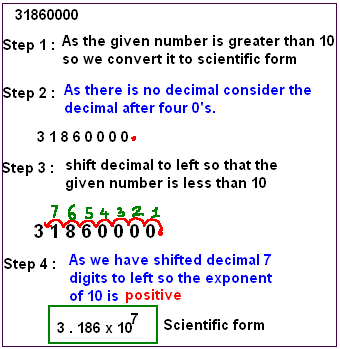 The decimal will shift 5 places to left, so the exponent of 10 is positive. 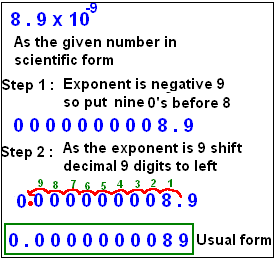 The decimal will shift 6 places to right, so the exponent of 10 is negative.